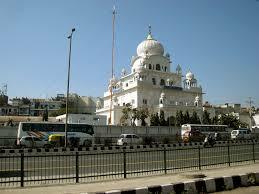 Here is Some Information about Gurudwara Moti Bagh sahib in New Delhi India. 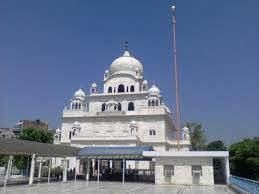 Gurudwara Moti Bagh Sahib is very oldest and historical Sikh Gurudwara New Delhi.Gurudwara Moti Bagh Sahib is located Ring Road, Moti Bagh,New Delhi. Gurudwara Shri Moti Bagh Sahib is an ancient Gurudwara, related with the ninth Sikh Guru - Shri Guru Tegh Bahadur Sahib. Earlier, the name given to this Gurudwara was Mochi Bagh and afterwards the named was changed to Gurudwara Moti Bagh Sahib.This gurdwara is associated with the Tenth Guru, Shri Guru Gobind Singh Ji. Guruji came to Delhi on the request of Prince Muazzam, who had requested for help in the battle for the throne of Delhi. Guru Sahib camped at the site of this Gurdwara. On his arrival, Guru Sahib shot an arrow into the Red Fort, informing the Prince of his arrival. The Prince, astonished at this display of archery, exclaimed that this could only be a miracle. A second arrow arrived immediately carrying a note saying that it was not a miracle but sheer archery. 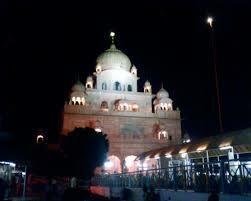 The Guru's meeting with the Prince took place at the site of Gurdwara Damdama Sahib. 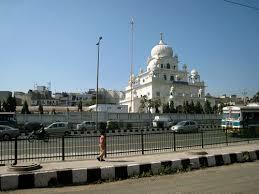 The tenth Guru Gobind Singh Sahib Ji is associated with Gurudwara Moti Bagh Sahib. Prince Mu’azzam had requested Guru Gobind to come to the Delhi and help him in the battle for the throne of Delhi. The battle started in the year 1707 after the sudden demise of Emperor Aurangzeb shook the people. An ardent devotee of Guru Sahib, Bhai Nand Lal, a poet and a great scholar, requested Guru Gobind Ji to help the prince, the eldest son of Aurangzeb. Guru Gobind Ji had a positive impression about the prince after he refused to attack at Anandpur Sahib. Mughal Emperor had deputed the king in Punjab to stop the activities of Guru Sahib. The chiefs of Shivalik gave very dangerous reports against the Guru to the Prince. But after finding out that all the reports were false, he wrote back to the chief saying that the Guru was a holy man and the Hill Rajas were the main reasons of all the troubles caused. The prince was also jailed as he opposed his father’s decision. What the prince wrote was not perceived well by Aurangzeb and henceforth he sent the best four generals form his team to find the whole truth behind the happening. To his surprise, the generals of Aurangzeb said that the Guru always led a saint life and never plotted or planned anything against anyone. The messengers then also punished those who had troubled the guru. The guru after fighting a brave war decided to vacate the fort of Anandpur Sahib on the order of Panj Pyare. In the course of all these battles, the Guru suffered heavy losses, but never had any grudge against the eldest son of the Mughal Emperor and agreed to help him in the course of the battle. He was known for his fine archery and when he shot two arrows from Moti Bagh, it hit the Divan of the prince. The famous Guru Granth Sahib Ji is placed where he actually shot the arrow. It is nothing else but respect to his fine archery skills. By Road : There are many public and private vehecals available to reach Gurudwara Moti Bagh Sahib New Delhi.One can also go by the DTC buses. By Metro : The Nearest Metro station is Moti Bagh meto station New Delhi. By Rail : The Nearest Railway station is Hazrat Nizamuddin station. (17 Km)The other stations are Bijwasan railway station, Shahabad Md Pur station, etc. By Air : The Nearest Airport is Indira Gandhi Internation Airport.